Love the Starbucks Cheese & Fruit Bistro Box? You can make these at home for so much less money. In fact, you can make 1 at home for what 1 costs you at Starbucks. Need a quick lunch or snack while on the go? The protein box from Starbucks may be the answer! Now you can make this easy recipe at home. Recently Starbucks has been adding more food items to their menu. They have seasonal favorites that they bring back each year and they have also expanded their breakfast and lunch menus. One of the newer additions are the boxed lunches they offer. They are perfectly portioned and great for grab and go lunches or even a quick snack. One of the boxes is the protein box packed full of nutritional ingredients to fuel your body. 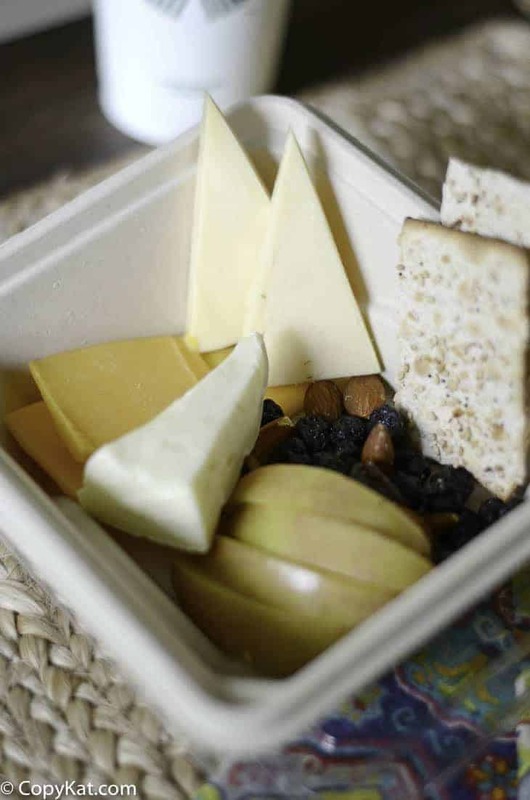 It contains dried cherries, almonds, three types of cheese, apple slices and crackers. The great thing about the protein box is that it will fill you up with the right kind of nutrients minus all the junk. The Starbucks protein box is easy to make at home and even customize. Don’t like cherries? Use cranberries instead! Not a fan of almonds? Pecans do the job! I do not like green apples for snacking so I opted to use Fuji. If you need to store this for a few hours before serving Costco has some great pre-packaged apples that are great to use. Plus once you buy all the ingredients you can make two or three boxes for the small prices as one at Starbucks. Talk about good for you and your wallet! Love Starbucks recipes? Check out these favorites. 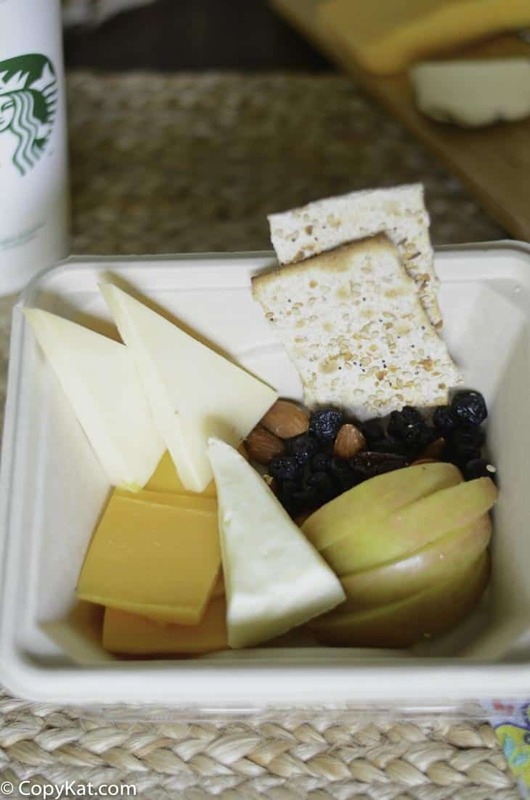 You can recreate the Starbucks Cheese and Fruit Bistro box at home. Slice your cheeses and arrange them in the box. Add your crackers to the side. Mix together the almonds and cherries and toss them in. Place the apple slices in the box and you are done. I have Celiac Disease and I can’t eat any of them cause they have bread of some kind. I can’t just eat around the bread either. If they would make one without bread it would help us out. I know I can make this myself but if I’m out running errands and get hungry this would be perfect to eat out of hand. I know they make a breakfast sandwich that has a gluten free bun like an English muffin and it’s made in a gluten free area so we don’t have to worry about cross contamination. But thanks for all the great recipes you have here. Sorry to run on. No problem 😉 We all have unique dietary requirements. I will do a bunch of these at once to help me save money. I will put them in containers in my house and have them ready for me for when I am on the run. One thing to note is that the Starbucks one is Gluten-free, including the crackers. I never would have noticed if my friend with celiac hadn’t been raving about how great the crackers are. If you ever come across any GF crackers that are as good as the Sbux ones, please add it to the post! Let me see… you can make 1 of these for the same cost as buying 1 at Starbucks. So, apart from the fact that you can change items to your personal preference you haven’t actually saved any money. Or am I missing something here? I think this costs less to make each individual box than it does to buy this at Starbucks when you price out per ounce of food. So no it isn’t cheaper when you different types of cheese, an apple, a bag of nuts, and a bag of cherries. When this comes into play is when you use the full ingredients and you make several boxes at once. For some people, they care about the footprint of waste they generate, and using a reusable bento box or other plastic containers rather than purchasing something again and again that they will toss is important to them. For someone else, they may not like the Gala apple and they may want to use a Golden delicious. Others may have most of these ingredients on hand and can prepare a box with food they already have. Great combo. I make these to take on road trips so we do not stop for fast food. They are very satisfying for a mid-morning or afternoon snack. Lovely idea to make and deliver to someone in hospital.